You are here: Home / Advertising / FTC Food Marketing to Kids Update: Are Watchdogs All Bark No Bite? Sept. 9, 2010 Where are we now with the whole junk food marketing to kids/obesity prevention discussion? Case in point, today’s guest editorial written by Scott Traylor of 360Kid who recently sat down to a five-hour block of Saturday morning cartoons….Today he shares some of his firsthand findings on portion distortion, sugary cereal ads and the lack of industry ‘self-rein.’ When it comes to public health and putting the obesity problem into preventive context, it’s a mixed media message at best. Just this week, Ad Age (reg req) headlined that the FTC has subpoenaed 48 food companies regarding their marketing practices to kids (full list after the jump on repeat/new offenders) and though this seems like major progress on the watchdog woofin’ front, it feels to me more like gummin’ a rawhide with a toothless hound, when it comes to regulatory measures as they currently stand. As I wrote in our local newspaper/op-ed way back in ’06, there are REASONS Why Childhood Obesity Prevention Seems Wafer Thin. If you follow the watchdogs, the money trail, the wellness mandates undermined by lobbying groups and multiple conflicts of interest, they reveal a hearty Appetite For Profit (highly recommend that book about how the food industry undermines our health/how to fight back, btw). I guess I’m getting impatient with the ‘self-rein’ scenarios after seeing recent reports like Scott’s, because it’s not happening fast enough with policy that is tight enough to stop the ‘tower of babel’ of ‘better for you’ products that confuse and misuse labeling claims with lingo that undermines parents, and runs afoul of good health. For those of us in the trenches battling kids ‘at risk’ for a shortened life span due to obesity and diabetes issues, the fight for hearts and minds is literally a counter-marketing war. Example? Advertising unhealthy crud to kids may not be THE problem, but it is A problem. The need to fund programming and entertainment is NOT lost on this former creative director, but it cannot, MUST not be executed on the backs of these kids…There are scads of healthier options to underwrite these shows, many of which are NOT remotely aimed at kids. Just do it. Here, I’ll even help out…how about the cute lil’ Snoopy dog MetLife uses to hawk insurance and go after parents’ pocketbooks to keep junior safe and sound? Or everyday needs like toothpaste, toothbrushes, local produce boards and farmer’s markets…items that aren’t undermining the health and well-being of an entire generation but instead are CONTRIBUTING to kids’ health with a positive or at least benign presence? (Watermelon Board, anyone?) 😉 We even have a part of our media literacy games that we call the ‘switch pitch’ to come up with healthier choices. I strongly urge network execs and digital media pros to consider this with any and all programming, because when industry pros like Scott (and myself, and many, many more) note the tipping point of toxicity due to unethical backwashers trying to mine kids’ childhood for a buck regardless of the unhealthy outcome, watchdogs WILL woof, bite, (tweet, chirp, poke) and gnash and lash accordingly! For a capsulized ‘why to buy’ our words of warning, look no further than the emergence of interactive food and beverage marketing, mobile and social media’s powerful pull on the purse strings to see how fast and deep these industry ties will run over the rights of kids and parents. Read through this 12 pp pdf sponsored by RWJF written by Jeff Chester-Center for Digital Democracy and Kathryn Montgomery of American University for a solid ‘at a glance’ look at the tactics, while framing the conscience, ethics, interventions and safeguards necessary to play in the digital sandbox with fairness/full disclosure to families on food ploys targeting their kids under the radar. …”A handful of marketers that received subpoenas in 2007 were left off the 2010 list, presumably because they have limited their marketing to children. Think about which brands you want to support and why…vote with your purchasing power, and sound off to the FTC to let them know you’re watching the watchdogs. Teeth don’t have to be bared to be at the ready…snap happy parents could send the FTC into a regulatory feeding frenzy if pushed. Think about that, industry colleagues. Breakfast cereal is really not my thing. Sure I eat it, but when I’m reviewing commercials on TV for work, I’m usually looking for toys and techno playthings, not cereal. Recently however, while reviewing virtual world commercials as part of a new client request, I just couldn’t ignore the dozens of breakfast cereals being advertised to kids. After noticing how many there are I decided to start a little side project. I would watch one children’s television station on any given Saturday morning and see what shows up. To begin my experiment I watched a five-hour Saturday morning block on Nickelodeon. The technicolor explosion of sugary cereal ads blew my mind. Wasn’t there some standard, at least a code of ethics in place, that prevented marketing these cereals to children during their morning cartoons? After doing a little research I learned in late 2007 the breakfast cereal industry announced they would self-regulate which products would and would not be advertised to children. They defined a number of industry guidelines; one in particular stated that this coalition of companies would not advertise cereals that contained more than 12 grams of sugar per serving to children. 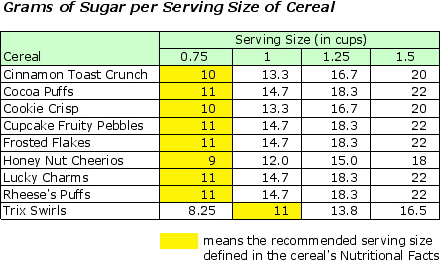 How much sugar did the cereals above contain? A quick trip to the supermarket revealed almost all skated just below the self-imposed rule of 12 grams per serving. But what was the standard serving size as part of this guideline? Almost all of these cereals recommended a serving size of 3/4 of a cup. Was that a lot? How much cereal does the average person eat for breakfast? The next morning I went to the kitchen, poured myself a bowl of everyday, non-sugary cereal and measured it. I found I eat about 1 1/2 cups of cereal for breakfast. I then asked a number of kids, ages 11 – 14, to pour themselves a bowl of cereal, after which I measured each one. Their bowls ranged from 1 to 1 1/4 cups, 33 – 66% more than the recommended serving size. The conspiracy theorist in me wondered if these cereal companies simply reduced the size of a single serving to guarantee they could get the sugar levels below 12 grams per serving. In an attempt to prove my theory, all I would need to do is find the Nutritional Facts for each cereal before the self-imposed 2007 regulations. Did you know that eBay and Flickr are both excellent resources for finding photographs of nostalgic cereal boxes? I couldn’t find all of the cereals listed above, but I did find a 1979 box of Cocoa Puffs and Lucky Charms. That year both cereals had a recommended serving size of one cup. Today, the recommended serving size is 3/4 of a cup. This retro cereal box sleuthing proved nothing though. These cereal companies may have changed their ingredients over the years, maybe even realized that one cup of cereal was actually too much to eat in a single sitting. I started to wonder if all this sugar-talk was a moot point. Just how much sugar is actually okay to eat in one day? In 2003, the World Health Organization stated that a person’s daily caloric intake should not exceed more than 10% from sugar. If a typical adult calorie count per day is 2,200 calories, the 10% ceiling translates into about 12 teaspoons or about 50 grams of sugar per day. After this announcement the US Sugar lobby had a fit with the WHO’s sugar guidelines and countered that the daily caloric intake of sugar could be as much as 25% per day. That’s about 30 teaspoons or 120 grams of sugar per day. Last year the American Heart Association recommended no more than 6 1/2 teaspoons or 25 grams of sugar per day for adult women, and no more than 9 1/2 teaspoons or 37 grams of sugar per day for adult men, recommendations below the WHO’s position. According to that math, if you have just one cup of any sugary cereal in the morning, and you wash it down with a cup of milk or orange juice, you’ve just about reached the upper limit of sugar intake for the day in a single meal. That means no more juices, cookies, sweets or deserts for the rest of the day. If this country truly wants to reverse the growing childhood obesity problem, relying on self-imposed industry regulations for food advertising clearly won’t lead kids (or adults) to healthier eating choices. Like I said, cereal is not my thing, but I just can’t ignore what I see on children’s television every day. The food ads kids consume on a regular basis are far from sweet, and when you begin to pull back the curtain on this sugary controversy, you too may find you’re left with a very sour taste in your mouth. Scott Traylor is the founder and Chief KID of 360KID, a Boston-based digital consulting firm specializing in the development of engaging interactive learning products for kids. Scott is actively involved in research, writing, and speaking about child engagement through new technologies, social media, and various consumer-based delivery systems. He also speaks frequently at consumer and education events and is a former graduate teacher of 12 years. Kaiser Study Shows 50 Hours of TV Food Ads/Yr. Healthy Student Vending Needn’t Be an Oxymoron? Here are some resources at the ready to get you started! Shaping Youth is proudly supporting ProjectLunch with Teens Turning Green.org… If your school or students would like to start a food club, come aboard! TTG has an entire toolkit at the ready to pay it forward and start a fun food club with local resources and partnerships wherever you may live. Stay tuned for more as we ramp up for back to school programs coming soon. Meanwhile, here are a handful of posts to help you live healthier and counter-market media messages piped into your own home. Farmers Markets Go Digital, Find Healthy Food Near You! Food Inc: Will Kids Be Hungry For Change? Using Shrek Against His Drek: Getting Kids to Eat Green! School Gardens Grow Healthier Kids: Seeding Green With Richard Louv!